My two previous blogs about municipal tools to create social facilities compared Vancouver’s municipal governance structure to Ottawa’s, reviewed what social facilities Vancouver has achieved and outlined some of the tools Vancouver uses to achieve these facilities. So what does this mean for Ottawa? Municipalities in Canada only have a limited set of powers; they don’t have robust taxation authority and have minimal control over markets. But let’s not forget that Ottawa, unlike Vancouver, has jurisdictional responsibility for affordable housing and has many of the same resources and planning tools as Vancouver. In April 2016, Ottawa’s Alliance to End Homelessness (ATEH) released its 2015 Progress Report on ending homelessness in Ottawa. The report highlights a mixed-bag of modest improvements and disappointing results. On the plus side, for the first time since 2006, the average length of stay in Ottawa’s emergency shelters was reduced by 6.4%. As a result of new supportive housing units there was a 3.4% overall reduction in the use of shelter beds among singles and targeted interventions to keep individuals in their housing are showing success. Unfortunately, there was a 4.9% increase in the overall number of homeless individuals accessing emergency shelter beds. In other words, individuals are there for fewer days, but there are more of them. This increase is mostly attributable to the increase in the number of families accessing shelters. In 2015, 39% of all shelter clients were members of a homeless family. Equally worrisome, 2015 saw only 24 new affordable housing units, the lowest number since 2005­­. In 2013 Ottawa adopted a ten-year housing and homelessness Plan, Our Ten Year Plan 2014-2024. The Plan clearly states a community goal to end long-term homelessness. There are numerous aspirational statements about partnerships, building on collective strengths and finding innovative ways to leverage assets to increase the housing stock but no firm targets for creating affordable units and few concrete suggestions for using the City’s own resources. What’s the point of a ‘Plan’ if it’s not backed up by resources? 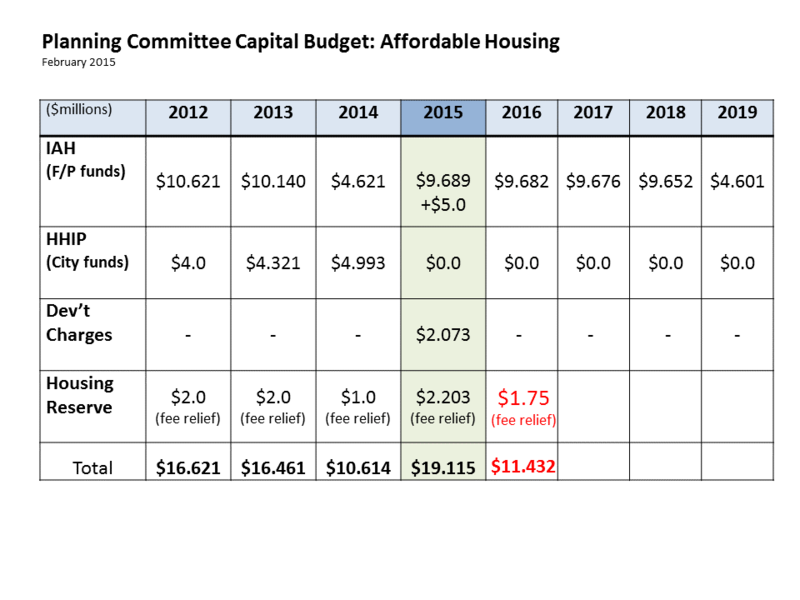 While the City doesn’t publicly report on its annual creation of new affordable rental housing, the information can be found in the ATEH annual report cards. Between 2011 and 2015, 606 units were created — 121 units per year. Compare this to the City of Vancouver, which overachieved on its 2011-2014 targets of 650 units per year and has set a similar per year target for its 2015-2018 Capital Plan. Vancouver allocates about $22.0M per year for the creation of new affordable rental housing. Although Ottawa contributed between $4.0M and $5.0M of its own funds towards the creation of new units between 2012 and 2014, it doesn’t plan to contribute any funds between 2015 and 2019. Data compiled from City of Ottawa budget documents. On the positive side there is every indication the City will benefit from the recent Federal/Provincial announcement regarding new social housing infrastructure money and they plan to hire new staff to assist with developing the projects. Additionally, by providing housing supports and rent supplements the City has managed since 2013 to place almost 300 people into permanent housing. Still, for a City with 7,000 unique individuals accessing emergency shelters, 10,500 households on its five year long waiting list for a subsidized unit, it’s not good enough. The City of Ottawa needs to make better use of its existing tools. It has many of the same planning, regulatory and resource tools that Vancouver has but it often fails to use them as effectively. It needs to connect the dots between its established policy and its actions. It actively acquired sites for affordable housing. Surplus city land was purchased, set aside and held in an affordable housing land bank. A well-staffed Housing Branch (now defunct) worked with the provincial Ministry of Housing to allocate the sites to local not-for-profit groups. It looked for opportunities to co-locate affordable housing as part of the creation of new municipal facilities. 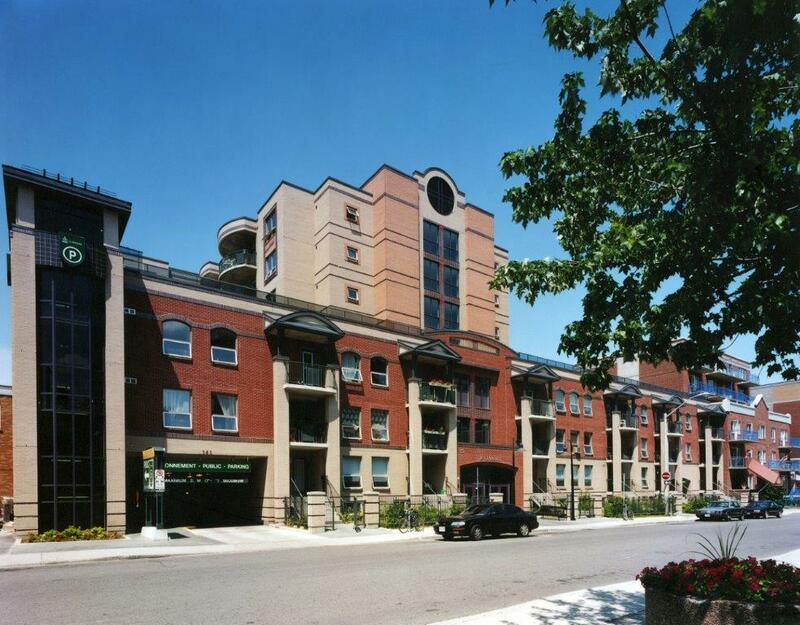 CCOC has two projects that are co-located with municipal parking garages, one of which is also co-located with the City’s own non-profit housing corporation. The redevelopment of the City’s Thorncliffe Village site included affordable rental housing as well as low-end-of-market home ownership. The City had a ‘3rd Sector Liaison Officer’ whose job included expediting the affordable housing projects through the City’s development approval process. This position no longer exists and twenty years later the City now expedites development applications for large private sector corporations. Ottawa should make better use of its powers under Section 37 of the Ontario Planning Act. This Act allows cities to achieve public benefits when large rezonings are being considered. While Ottawa’s ability to negotiate public benefits is much weaker than Vancouver’s, it has further weakened this tool by agreeing to accept only 75% of the potential contribution. Ottawa should not only maximize its Section 37 achievements but also create policy and practices to ensure affordable housing and other social facilities are prioritized as public benefits. Ottawa should provide land opportunities to non-profit groups attempting to achieve additional affordable units outside of the City’s Action Ottawa housing delivery program, which is not meeting the need. Unfortunately, a surplus City property on Randall Avenue that had once been set aside as affordable housing for families, was recently sold. The housing sector is resilient has shown great capacity to find funds to create units outside of formal housing programs, but the City needs to support these groups by providing land at no cost. By doing so, Council is not only helping the groups but also helping to meet its own housing responsibilities. Co-location with New Municipal Facilities. The city acquires and provides land for important public objectives. It needs to co-locate these new municipal facilities with new social amenities. This includes parking garages, libraries, fire halls and new transit facilities. Rent supplements provide subsidies to low income household allowing them to pay market rent. Currently this limited pool of rent supplements is shared between the private as well as non-profit landlords. By limiting the subsidies to just non-profit agencies, Ottawa can ensure this resource is maximized and the lasting benefit remains within the public realm. Development permit and building permit fees should be waived for all affordable housing projects, not just those being created under the Action Ottawa program. In addition, the costs of this waiver should not be borne the City’s housing budget. Official Plan policies should incentivize the creation of affordable housing through the development process. This includes density bonusing and inclusionary zoning for non-profit rental housing projects. There have been many recent rezonings where soils contamination or better architectural design has been a rationale for increased density. Why not use this planning tool to create amenities that support the City’s jurisdictional responsibilities and social needs? Create policies that encourage developers to ensure land is set aside for affordable housing in large new neighbourhood projects. This was ignored when the City redeveloped its own Lansdowne Park property but opportunities such as Rockliffe Park, Lebreton Flats and Zibi still exit. Dennis Carr returned from Vancouver in 2014 where he spent five years as the City’s Assistant Director of Social Infrastructure. Prior to working in Vancouver he spent 19 years as the Development and Construction Manager for Centretown Citizens Ottawa Corporation, one of Canada’s largest non-profit housing corporations. He is the recipient of the 2016 Canadian Housing and Renewal Association’s Lifetime Achievement award.